I've been MIA for a couple of weeks. The first week my mom came for a wonderful visit and the LOML and I went away for the weekend (sigh of contentment), and then the second week, I had a complete melt down (origin unknown) and went to a very dark place. (It had nothing to do with my mom's visit, honest.) I don't know what happened. I'm going to point the finger at hormones and leave it at that. 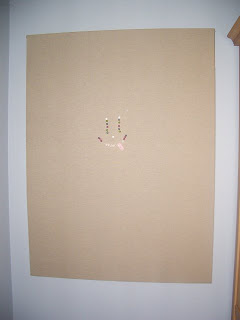 Hanging on the wall, in a location I can see while laying in bed if I turn my head to the left, is a big (3'x4'), linen-covered bulletin board. I tack images on it that make me happy. You know, shoes, lake houses, travel destinations, etc. During my ugly time last week, I took everything off and just left the assortment of tacks scattered randomly. 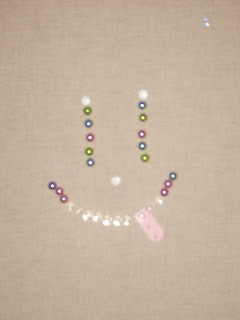 This is what my 14 year old son did with the tacks to try and put a smile on my face. My husband added the "tongue" the next day. It's a piece of paper from the top of a business form. In other words, trash. Clever boys. Glad to have you back!! I've missed your posts!! !